Galaxy Note 9 arrived back in August and boasts a wealth of premium features. 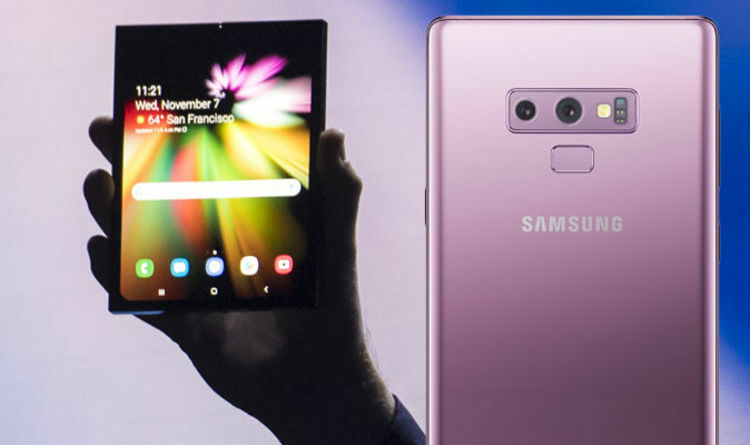 Note 9 builds on everything its predecessor, the Galaxy Note 8, did right by increasing the size of its screen, battery and improving its camera. Moreover, the Note 9 also came with an improved processor that offered faster performance across Google’s Android operating system. And it appears the flagship phablet has a huge advantage over the newly-revealed Samsung foldable phone. During its developer conference being held in San Francisco, the South Korean tech giant finally showed off its long-rumoured foldable hardware. Samsung first teased such a product back in 2014, however it appears the device has finally come to fruition. Justin Denison, the senior vice president and general manager of Samsung Electronics, took the stage last night and produced the foldable technology from his pocket. Harnessing the power of the manufacturer’s “Infinity Flex” technology, the smartphone was showcased touting a “cover display”, in addition to its main panel. The former comes in at 4.58-inches while the latter is reminiscent of a tablet format thanks to is 7.3-inch size. During the keynote, Samsung showed a slide discussing the specifications of the two panels. The cover display comes in at a resolution of 840×1960 and has a density of 420-pixels per inch. Meanwhile, the 7.3-inch display has a resolution of 1536×2152 and has the same density. An image of the specifications slide was captured by CNET reporter Shara Tibken and posted to Twitter. However, while the Galaxy Note 9 comes with a single 6.4-inch panel, the pixel density offered is higher than Samsung’s foldable product. Note 9 has a lower resolution, coming in at 1440×2960, but the screen has 516 pixels-per-inch. Such a sum is almost 100 pixels-per-inch more than the Samsung foldable phone. This could mean pixels are more easily noticed overall on the South Korean tech giant’s recently announced product. While Samsung was eager to discuss the screen specifications of the foldable device, other details surrounding it were few and far between. What is known however is that Google has announced support for foldable displays on Android. At its Android Developer Summit, Dave Burke, Android vice president of engineering, said: “You can think of the device as both a phone and a tablet. “Broadly, there are two variants – two-screen devices and one-screen devices. Burke also emphasised a need for “screen continuity” for future foldable products. Samsung’s foldable phone is expected to go into production in the next few months, however no firm release date for the product has been revealed.